I thought I’d try to get at least one last Time Travel post in, even though I really should be writing for work, or packing, or doing dishes. I don’t even have a really good comparison photo, but it’s close enough. What you see in the older photo is a view of a couple around 1900 walking along the north side of the cathedral, along what is Voetiusstraat. It’s a strange view if you’re used to the street now, because while the buildings on the right hand side of the photo remain (the one with the writing is now the delicious Carla’s Condoterie), the left has changed dramatically. I think it was around 1910 that the street was widened and the buildings on the left were constructed, particularly Voetiusstraat 2-4, which is a fairly impressive building done in the neo-Renaissance style. It was used as a public reading hall/library. For the record, the street gets its name from Gisbertus Voetius, a 17th century professor of theology, whose house once stood there. What is interesting about this section of street where Domstraat intersects with Voetiusstraat and the cathedral is the new herringbone brickwork that has gone down. It’s all more even and in an earthier, tawnier color. It really does look quite nice. I wish I knew how far it’s going to spread. In this slightly different view, you can’t see the buildings as clearly, but you can see the step into the cathedral that is visible in the old photo. The street levels do change a bit over the years, but the lamps remain much the same! 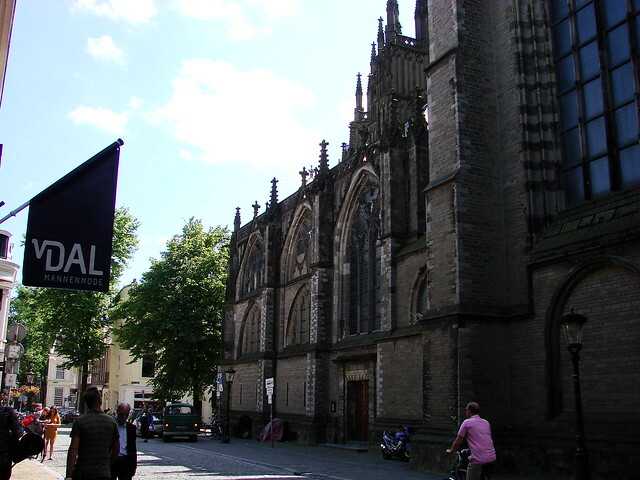 This entry was posted in history, photos, points of interest, time travel and tagged carla's condoterie, domstraat, old photos of utrecht, then and now, time travel, utrecht cathedral, Utrecht history, utrecht photography, voetiusstraat by Alison. Bookmark the permalink.